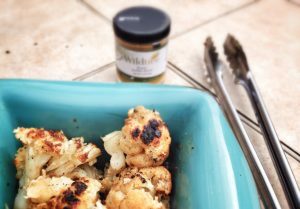 This Buffalo Cauliflower “Hot Head” is a fun treat to cook using all natural Wildtree Butter Grapeseed Oil and Buffalo Spice Blend. The ingredients and recipe are about that easy. Just add a head of Cauliflower. If you want to get flashy try doing it all without any grate or pans. 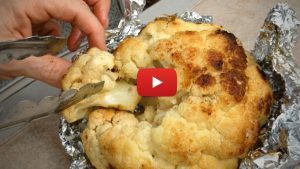 We roasted the entire head of cauliflower over a bed of charcoal for about ten minutes and the results were perfection! Watch how in the video here.